Age: 24 years old Specialty: Sculptures Likes: Initially unknown Height: 175 cm (5'8.5") Weight: 62 kg (136.4 lbs) 24 years old and a 6th year student in the beginning of the series, Morita occupies room 203, his floormates being Takemoto and Hasegawa. 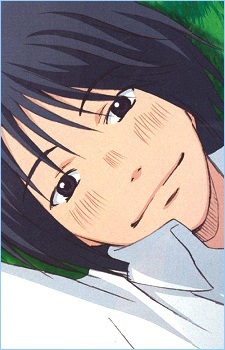 Morita is unable to graduate, as he can never wake up on time to go to classes. This is mainly due to the work that he does, which forces him to go missing for periods of time. What he does for work though remains a mystery. When Morita comes back from his mysterious job, he immediately falls asleep for at least 48 hours, due to the amount of work he does. He also returns with a large sum of money in his back-pocket and brings a food item to share with his flat mates. Although the flat mates believe he does it to mock them, such as when he brings a bag of croquettes instead of meat, Morita does care deeply for his friends such as Takemoto. Morita is a very mysterious person. He does many random, crazy things for his personal enjoyment, such as creating a twister game with too many colors, which resulted in horrific pain for him and Takemoto. Morita is a perceptive individual, but tactless and often states the truth, such as how Mayama secretly stalks Rika outside her apartment, when nobody wants to hear it. He also expresses his love for Hagu in weird and quirky ways, such as forcing Hagu to dress up as a mouse. Morita's obsession with Hagu stems from a fondness of cute things during his childhood, such as causing a cat to become neurotic after cuddling it too much. As a result of Morita's obsession Hagu becomes afraid of him and tries to avoid him but eventually falls in love with him later on. Despite the way Morita treats Hagu he sincerely cares for Hagu, getting her a pair of expensive mules and creating a broach with a dove on it, both of which was in her scrapbook of things she wanted. Later in the series, Morita leaves for America for work without saying anything to his friends. He eventually returns in about a year's time, and Morita's friends finally discover what he does for his work, being awarded best CGI in the Mocademy Awards (a spoof of the Academy Awards) for the movie 'Space Titanic', after studying with acclaimed director Peter Lucas. Morita's room, which no one had ever been inside, had also been discovered after his departure, and contained a lot of high tech equipment. After returning from America, Morita finally manages to graduate from his course in his 8th year handing his work in on the very last day. Despite graduating and becoming rich from his work in America, Morita applies for a Japanese Arts course believing he hasn't studied for long enough, even though he's been there for 8 years. He re-enters the art school as a 3rd grade student, having already completed half the subjects.